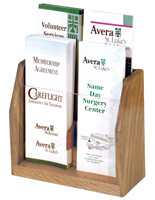 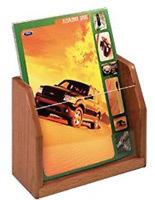 Fits standard pamphlets 4" x 9"
This wooden literature organizer for commercial use enables service providers and retailers to present promotional information in an organized, attractive manner. 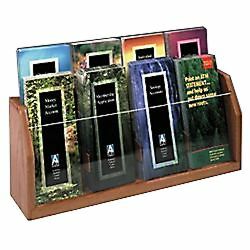 This paper sorter features eight clear acrylic pockets in a stepped configuration that makes back contents visible. 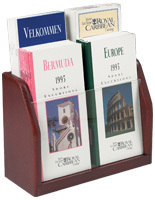 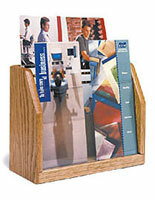 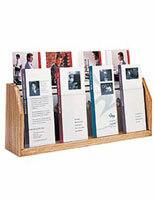 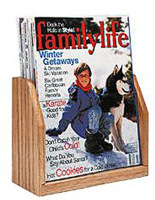 This literature organizer that is a brochure holder adds warmth to any décor. 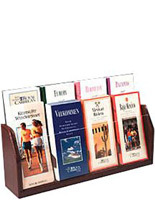 This displays system for a countertop keeps trifold publications and leaflets safe while also making them accessible to customers. 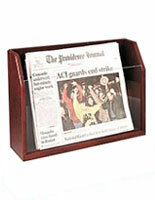 This organizer, also known as a pamphlet case, is constructed of solid oak, suitable for years of use.